Thanks again for the great book! It's a huge hit in the family and our daughter thinks it's the best thing ever to have a book with her Ollie Wallie in it. Excellent book, fab story, beautiful illustrations and fantastic service! Can’t recommend enough buying this hilarious tale with the added personalised bonus!! Two extremely happy children! 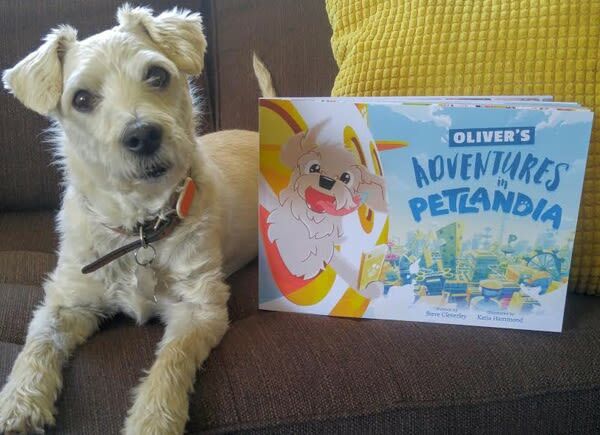 Hogan with his Petlandia Adventures book! We got it for Hannah for her birthday as she loves him so much and we were all really pleased with it!